2015 work for four clients has earned recognition in the SIAAwards. Print ad, a new website, a magazine and an integrated campaign … we’re thrilled! Out of more than 1,700 entries from more than 500 agencies, Creative Company’s award winning creative work was recognized by SIAA for work with Salem Convention Center, Berkshire Hathaway HomeServices Real Estate Professionals, Church Extension Plan, and McMinnville Downtown Association. 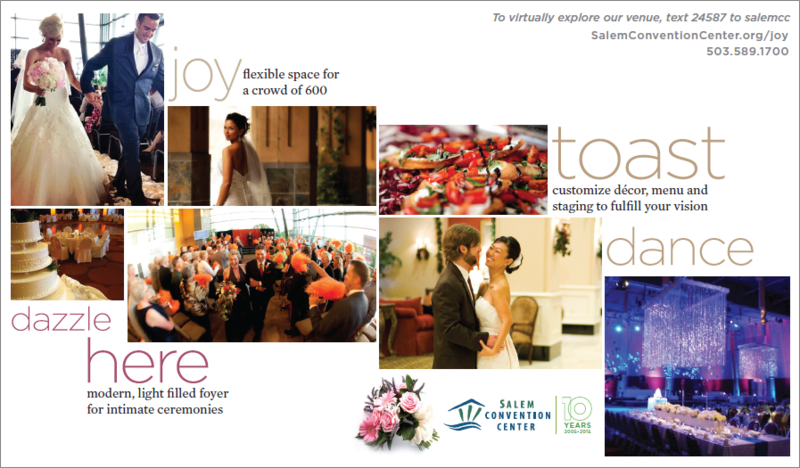 This ad for Salem Convention Center won a silver SIAAward. 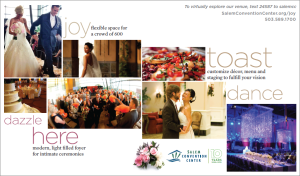 Two silvers were awarded for the work Creative Company has done with Salem Convention Center–for a bridal magazine ad for Willamette Living and for the new website. Strong images and brief words draw readers in. Both offer strong visual impact and highlight critical decision factors for the target audiences. Review the Salem Convention Center case study on our website. The gold award winning creative newspaper ad series supported the launch of the new Berkshire Hathaway HomeServices Real Estate Professionals brand. To capture quick recognition after the transition from Prudential, three key messages tied together many ads in different sizes and publications: even better now, same exceptional people, and real time real estate. Creative Company also earned a gold award for Partners, a magazine created for Church Extension Plan, a financial ministry. Developed to reach multiple audiences, Partners brings Church Extension Plan’s services to life with award winning creative. From story planning to copy and layout, we’ve created a sharable resource filled with interesting articles and photos. The award recognized the edition focused on Church Extension Plan’s 65th anniversary. This poster shows the grid of photos and numbers used throughout the integrated campaign. Another silver was a bit closer to home–for Creative Company’s concept, strategy, design and management for TasteMac. This wine and culinary tourism campaign was funded by a grant to the McMinnville Downtown Association. The award winning creative multimedia campaign encouraged visitors to dine, sip, stroll and enjoy all that McMinnville (Mac) has to offer. 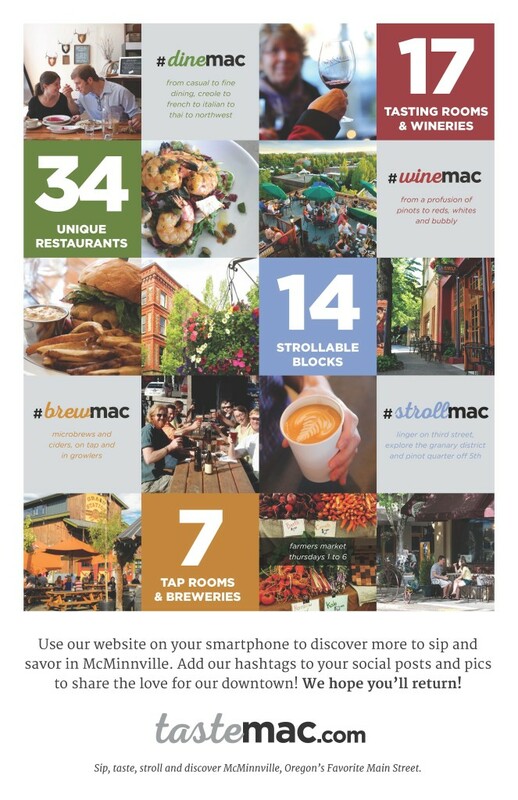 The “Taste Mac” theme focused on the numbers—34 restaurants, 17 tasting rooms and 7 breweries and pubs in 14 strollable blocks. Review the case study on our website. All marketing pieces–rack card, easy to follow map, static clings, magazine ads, coasters, AdWords campaign and posters sent visitors to the mobile-friendly website. SIAAWARD is the only advertising awards to specifically recognize advertising achievements in the service industry. There are 26 categories and 7 groups judged by a national panel of industry specialists, who judge creativity, marketing execution, message impact, technology application and innovation of content. 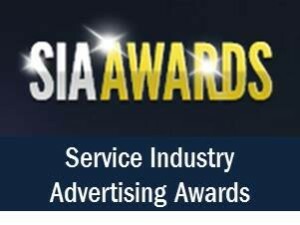 Additional information about SIAAWARD can be found on the SIAAWARD website at www.siaawards.com.